Best of Kickstarter 2012 – Join us for a look back! Funded! This project successfully raised its funding goal on May 18, 2012. Without any further ado, the moment you have all been waiting for has arrived – we’re thrilled to announce that we’ll begin shipping Pebble on January 23rd. We’ve been working very hard for the past year to deliver something that we’re truly proud of...and we know that we would not have been able to do it without the support of our Backers. So thank you! 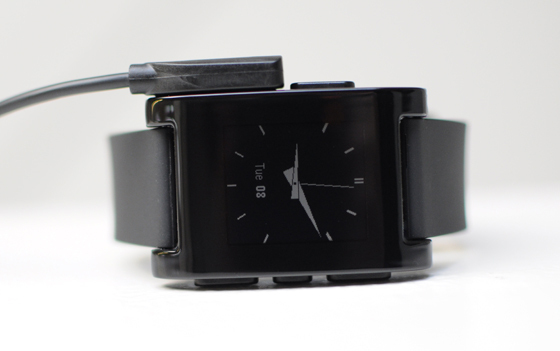 We just wrapped up our live video demo of Pebble. You can review the video here: http://new.livestream.com/accounts/2432013/CES2013/videos/8991209. Please excuse the discolouring in the video; we will get that fixed up and reposted as soon as possible. Also, as many of you have speculated, we can confirm that Pebble uses a magnetic charging cable. This was done to help achieve a 5ATM water resistance rating, perfect for running in the rain, skiing, swimming and washing dishes! And one last fun and useful tool – the accelerometer we’ve built into the watch allows you simply to tap or flick your wrist to turn on the backlight. We’re planning to continue our aggressive update cycle and ship new software updates every 2-3 weeks. Notably missing from our launch release is support for Runkeeper. We're working closely with RK and estimate that it should be enabled by the beginning of March. Sorry about that! Thank you! Looking forward to my mail. Reading these comments some people cannot stop being negative. Someone should make an app for their watch with a bitching and moaning sound. So happy! Toooooooo happy !!! Eric said in his Pebble speech at CES that he didn't know of any other watch that had an analog text time watch face. Well, I actually owned one. It's the Arnette AR02301. It's the same company that makes the sunglasses. They gave watches a try back in the mid-2000s, and they all swallowed a CR2032 battery in just over a years' time. Mine bit the dust when I dropped it and cracked the face open. 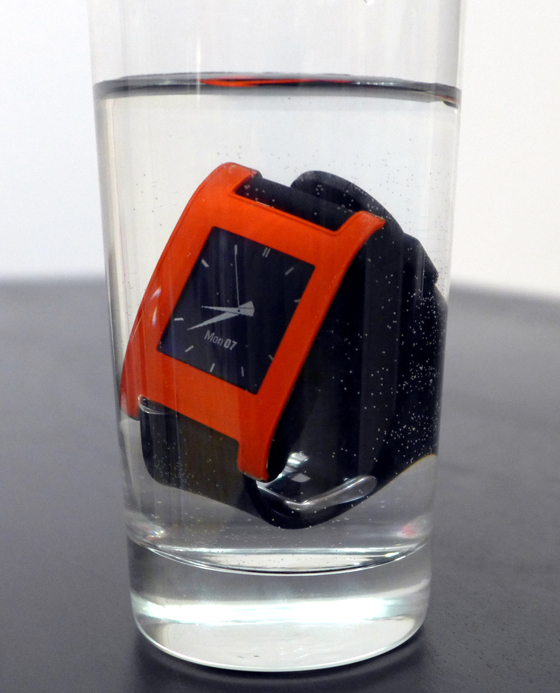 It too was water resistant, and had many quirky features, like the Pebble. It's the main reason why I backed the Pebble. I hope you enjoy these pics, and maybe you can replicate some of them without infringing on patents or copyrights??? I'd love to see my old watch come back to life. I believe the first magnetic power cord was for a deep fat fryer. Although they didn't patent the idea it proves prior art. The manual for ios is online! For me I'm guessing mine should arrive by late Feb or early March 2013 since I'm not a early backer. Just saw the Pebble in their Suite at CES! It's AWESOME!!! LOVE IT. Google Voice on Android fully supported on the Pebble!!!! Also on the IP side, in the video, a custom face watch called Pilot is a Bell and Ross watch inspiration, same issue, is there a risk Bell and Ross ( or any other watch maker, Omega, Cartier, etc... ) could stop you from pushing custom face that are similar to real watch ? Did you start discussing with them ? Possibly a stupid question but I presume that the shipping box will actually be put inside something else for the actual transit. I would be very worried if the shipping box is literally that as I'm sure some of them would get stolen in transit (it seemed to have branding all over it). I funded mine the 19th of april. Wonder if that means anything? Months ago Pebble team arrange test shipments to some volunteer backers from multiple countries. They test various methods of shipping to check many factors and problems that might happen such as time of delivery, the box design to protect Pebble to safely in one piece, custom and tax etc. My first test shipment arrived from Hongkong quiet fast but got me charged for tax and duty (declined as they advised) and the second test shipment arrived without tax and duty charges but came in almost two months and this time shipped from Sweden. I guess with enough data from test shipments they will use various shipping methods best fit to backers in different countries or regions. @michael - its an android watch face I created for another smartwatch so it should be super easy to convert it to pebble. Can't wait! I'm LOVING the "Kickstarter Edition" embossing on the back. Thanks Pebble team! early, you should be in 1st batch. i've got things harder - originally backed on april 14th and then changed to a pair on may 8th. If you go to My Backer History, it will tell you the day that you backed this project. Now, what that means, I don't know. I was April 16th. Is that early or late. @Centipede... Probably not. Pressures increase as you move. It's only shown as rated for bathing, swimming, and splashes on many water resistance comparison scales. Dose the 5ATM water resistance mean I would be able to wear this while scuba diving? @Leonidas watch faces only. you won't be able to do any app (ie. what's today calendar app) which communicates with phone, uses onboard sensors, etc. there should be simulator and sdk available long ago so there would be reanosable number of apps available on day 1. I don't want mine delivered in a glass of water! I'm so looking forward to this, I was not sure how early on I was, so I searched my mail as someone suggested, and according to Amazon I pledged on the 12th, so it looks like I'm in the first batch. Woohoo. Awesome job guys, I can't wait to get my first wrist watch in 20 years, my last one was one of those calculator watches in the 80s. Too bad you ship from China to EU, this means they will add tax and customs, please as someone said specify the replacement cost on the shipping label. Nice keynote and a cool hands on at engadget. With a bit of luck it will arrive around my birthday on Feb 7th. Can't wait to play with the Pebble watch itself and the SDK. I'm also quite bemused at some of the comments that still expect Pebble to either withstand greater ATM or wider bluetooth range, etc. It currently heaps of cool features already - and now repeat after me, it is still only a *watch*, albeit a smart one. It won't turn you into a better singer, an expert horserider, a skydiver or a belly-dancer. I can't wait to have this baby wrapped around my wrist!! Looking forward to receiving my Pebble. But here's the thing - on the shipping manifest you need to make sure you state the replacement cost of the watch as the value, not the Pledge or retail value. Why? I will pay tax of 20% on the stated value above $25. So stating a value of say $125 will result in a tax of $20 plus a charge of $13 for all watches shipped to the UK.Same will apply in most EU countries. Please ship with care! Really looking forward to goodies arriving. So pleased to have been part of this project, I've never backed anything before and despite some folk expecting miracles, I think you've done a fantastic job so far. Technology and how we use it changes so fast, you have always been faced with an uphill battle - I believe you might well be the victors. Keep up the good work. I propose you search for the comments from the crybabies on shipping for the past few months and send their pebbles in July. Pleasantly surprised to find that I backed this on the very first day. In an office environment I've been able to get 25 meter range on a bluetooth device. Thats ample for me. @Caffeine Junkie have you seen watch irl? if yes, it's good. i had an impression that that's not video artifact, as it was overall quite smooth. and i got an impression that there is relly too much space between watch ends and a wrist, esp. on engadget vid, where a guy with thin hand presents it. Caffiene - I know it's theoretical. My office is barely 40 feet from my living room. My point is the added range and features of BT4.0 opens some possibilities. @Andrzej there is no animations ghosting. This is LCD not E-Ink. It takes quite a concerted effort to induce the backlight through motion. You can change the strap, and the watch is in no way bulky. Oh, I'd also like to debunk this 'water resistancy dynamic pressure' myth that I see everywhere. I'm a watch fiend. I have way too many. Most of them are dive watches. I'm constantly reading about this stuff. Here's the deal - Typical human behavior underwater - diving into the pool, swimming, wading, etc. all generates an inconsequential amount of additional dynamic pressure on top of the static pressure of the water at depth. If you're somehow able to move at 5m/sec (none of you can), you'd generate an additional .1 ATM of pressure on your watch. I can post the math if people don't believe me. The real danger is the fact that it is unlikely that EVERY individual watch is pressure tested. Back in the day, before the tight tolerances we have today on items, this could vary widely from watch to watch- With today's CNC machining, etc,. there will be very, very little variation in this specification. It should be safe to say that 5ATM will be plenty to do all the things you want to do - swim, shower, even snorkeling without much to worry about. Just make sure to rinse well after exposure to salt water - and avoid submerging in soapy water as the lubricants and surfactants can more easily get past seals than good ol' h20. Orange still looks like dung.